TAUNTON, Mass. – One of the biggest challenges that all teams have faced so far this Spring has simply been getting outside and playing on an actual softball field. Taunton entered Friday’s showdown with top-ranked Milford with two games under its belt. Meanwhile, this was the Hawks first game of the season. That experience paid off the Tigers, overcoming a one-run deficit with four unanswered runs between the fifth and sixth innings to beat the Scarlet Hawks, 4-1. The Scarlet Hawks were the home team despite playing at Jack Tripp Field on the campus of Taunton High School. After senior Ali Atherton retired the side in order in the top half of the first, Milford’s offense looked like it was going to get off to a big start in its first at-bats of the season. Emily Piergustavo and Jess Tomaso earned back to back one out walks and Maggie Farrell reached on an infield error to load the bases with one out. But Taunton’s Courtney Fisher (CG, 2 hits, 7 strikeouts) settled in, inducing a grounder to third for the force out at home. Fisher then got a three pitch strikeout to escape the situation unscathed. Both Atherton and Fisher continued to deal through the second and third innings. Only Milford’s Kate Irwin was able to get a hit in either inning, beating out a throw for an infield single. The Scarlet Hawks finally cashed in in the bottom of the fourth inning when junior Maddy Bonvino launched a 2-0 pitch just over the fence in left center field to give Milford a 1-0 lead. While the Hawks grabbed the lead, the Tigers seemed to wake up at the plate themselves. MacKenzie Handrahan led off the top of the fifth with a line drive single and two batters later, Katie Van Zandt hit one up the middle just over the head of Piergustavo at short to push pinch runner Kelsey White to second. A passed ball pushed both runners up a base and on the next pitch, Rebekah Lajoie hit a fly ball to right field. White came in to score on the sac fly and Van Zandt moved to third, but the throw to home to try and get white got past the catcher and out of play, allowing Van Zandt to come home to give Taunton a 2-1 lead. Fisher capitalized on the momentum, retiring the Hawks in order in the bottom of the fifth. Taunton’s bats continued to produce in the top of the sixth. Sophomore Jaime Brown, in her third year starting at third for the Tigers, roped a 0-1 pitch into left field. Brown originally stopped at third as the ball sat at the base of the fence, causing the umps to halt play. But after a quick check, the ball was deemed to have cleared the fence, giving Brown her first ever home run – at any level of softball. Liana Duarte followed with a four pitch walk and two batters later, Handrahan doubled in the run to give Taunton a 4-1 lead. Fisher retired the order in both the sixth and seventh to finish the game. Eighth grader Hannah Aldrich made an impressive back handed play at short to get the first out in the sixth. For Milford, expectations are still high for a club with plenty of experience. The fact is, the Hawks still have an entire season to go. “First game, tough opponent, tough place to play, they’re a great team that’s well coached,” said head coach Steve DiVitto. “It was a battle of the pitchers early on. Atherton and Fisher were spectacular early. We were able to go up on that home run and it almost seemed to wake them up a little bit. We had some opportunities early in the game, especially in the first inning. As the year goes on you hope you’re going to capitalize on those. But its the first game, you’re not going to win anything game one, you’re not going to lose anything game one. 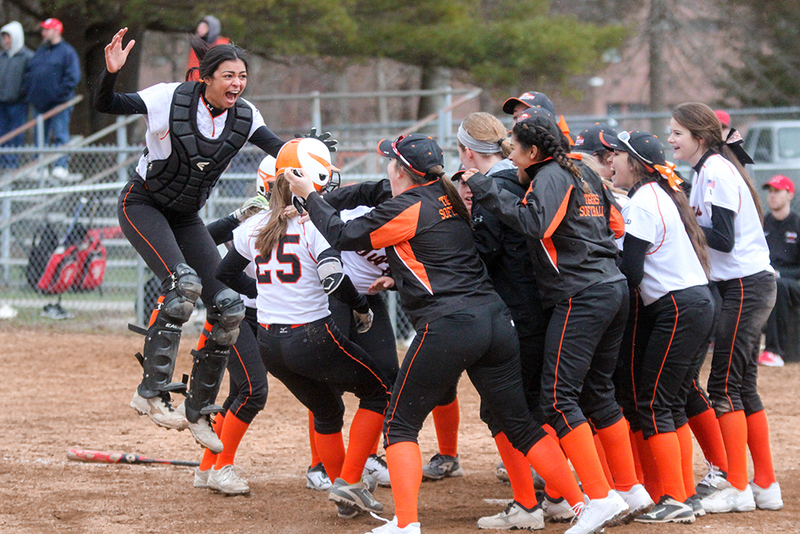 Taunton softball (3-0, 3-0) will travel to Mansfield on Monday to open up its Kelley-Rex schedule while Milford (0-1, 0-1) will host Stoughton in both teams’ Davenport opener.